Watercolour of the entrance to the Taj Mahal, Agra, by an anonymous artist working in the Murshidabad style, c.1790-1800. 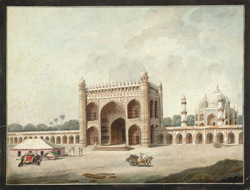 Inscribed on the back in pencil: 'Gateway leading to the Taaje Mahal'; in ink: 'Gateway leading to the Taje Mahal near Agra'. The Taj Mahal was built by the Emperor Shah Jahan (r.1628-58) for his favourite wife Arjumand Banu Begum upon her death in 1631. The tomb and accompanying buildings are organised around a garden divided into four parts by raised walkways with water channels at their centres. While the Taj mausoleum is made of white marble, the gateway is built of red sandstone and is crowned by 26 delicate marble chattri domes. Its façade is inlaid with floral, geometric and calligraphic designs in marble, including inscriptions from the Quran set in the rectangular frame surrounding the central pointed arch which is dated to 1647. The harmonious proportions and exquisite craftsmanship of the complex have made the Taj Mahal one of the wonders of the world.